I have a treat for you today! Meet my lovely and oh so gracious friend, Linda. I consider us to be related because she is my granddaughter, Miss M’s, other grandmother, aka “Granmommy” (I just love that!). Linda has wanted to renovate her kitchen for as long as I have known her. Finally – the time was right! 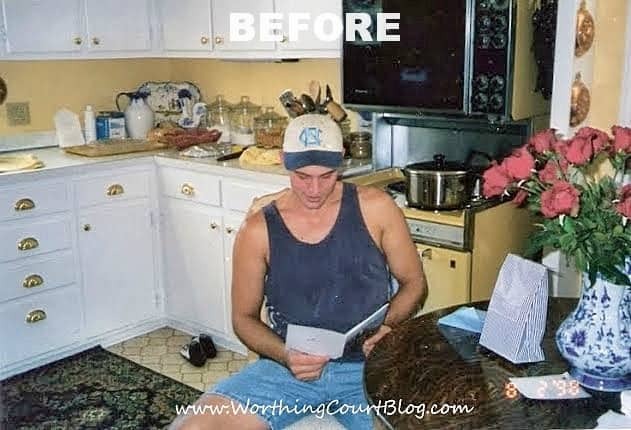 A wall between two 12′ x 15′ rooms in Linda and Gene’s 1970’s ranch was knocked down to create their now 12′ x 30′ dream kitchen. 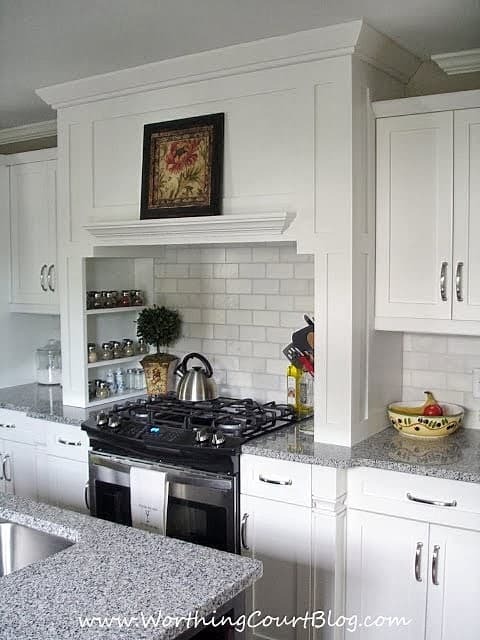 A cabinet designer helped to nail down the details, but most of the design was done by Linda. Her hubby did all of the demo and much of the work himself. 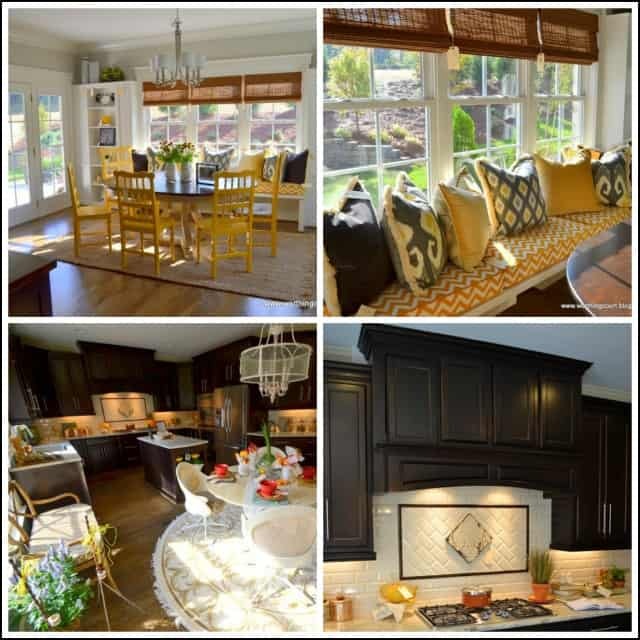 Sit back and relax while you enjoy a tour of her newly renovated kitchen. 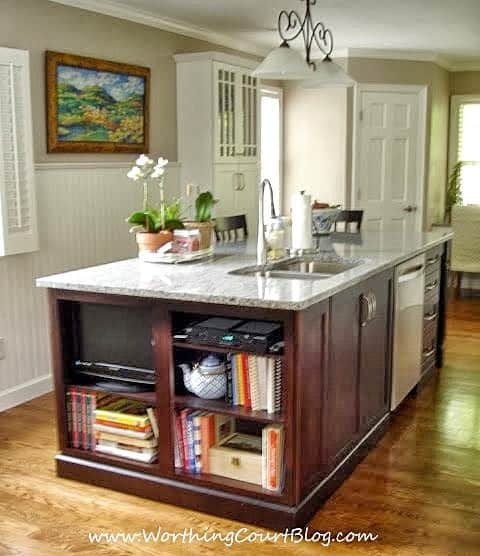 Two things that Linda knew she wanted – a lot of natural light and an over-sized island that would fit in the kitchen while still leaving plenty of room to move around it. The cabinet designer they worked with, Marsh Cabinets, suggested putting the sink in the island and Linda is so glad that she followed their advice. The tv and dvd player that you see on the shelves at the end of the island pictured above, are placed there purposely so that they can be viewed from the new eating area. 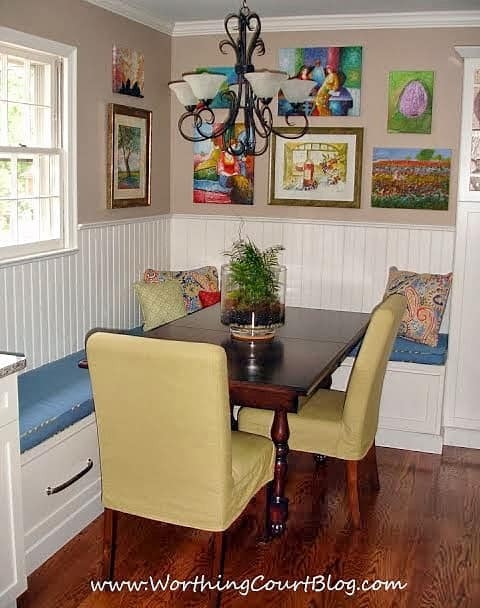 The eating nook is filled with original artwork that Linda has been collecting – including an original piece by our Miss M. Linda chose the fabrics herself and designed the cushions and pillows that she had made for the space. Here’s a before picture of where the kitchen sink and range were originally located. Hard to believe it’s the same space! That’s Miss M’s daddy, many years ago, btw. The new range with a custom hood was moved to the other side of the kitchen from its original location. Notice the built-in spice shelves on either side of the range. The front of the new refrigerator received custom panels that help it to blend seamlessly into the design. A new coffee prep area/wet bar was added to the corner opposite the breakfast nook. 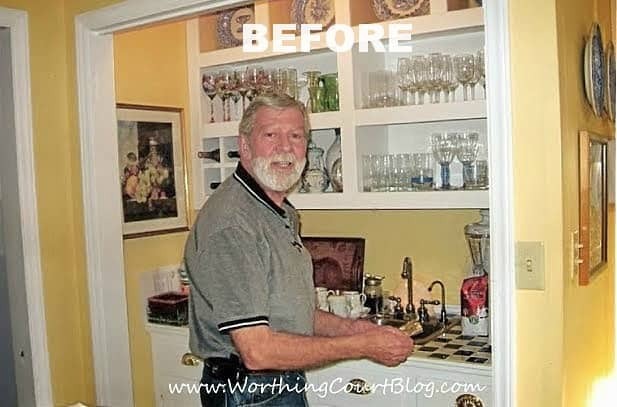 Here Gene is in another hard to believe before photo of the original wet bar area. 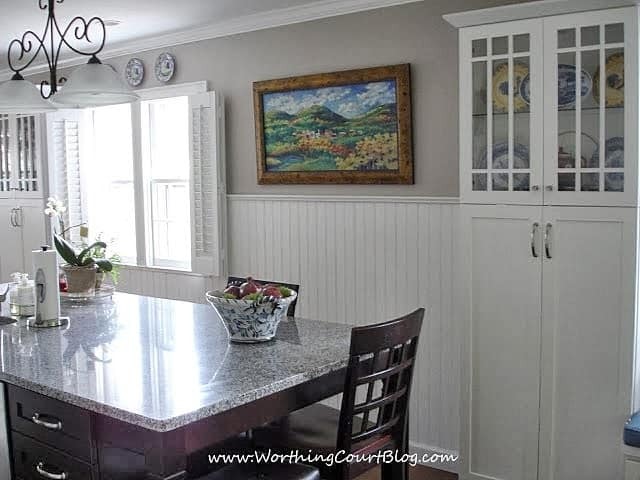 Two custom dish cabinets flank the wall and window area directly across from the island. The shutters that Linda added to either side of the window add lots of interest. 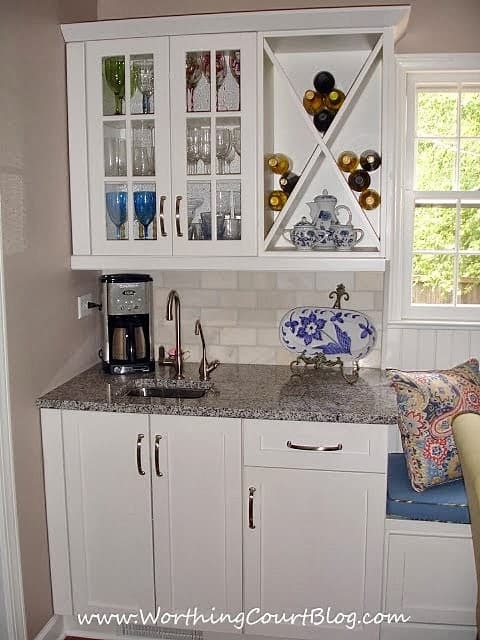 The cabinets provide loads of extra storage for Linda’s dish collection plus a lighted area above where she can display her favorite pieces. 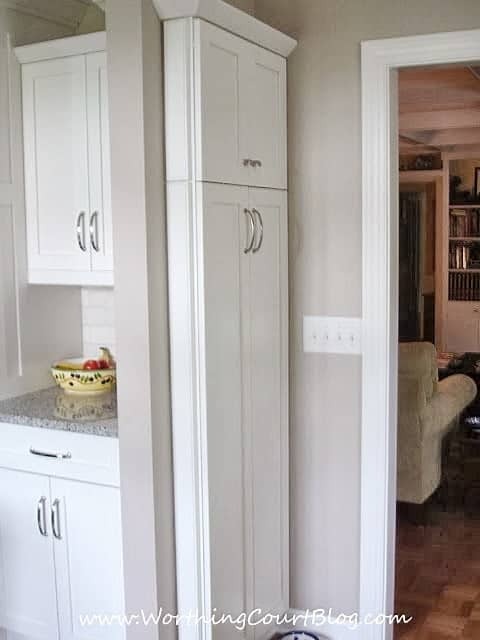 Once the wall was knocked out between the two smaller rooms, Linda originally planned to add a huge walk-in pantry at the other end of the kitchen. But, the decision was wisely made to put two smaller walk-in pantries on either side of the existing window. It made the perfect spot for a desk area, especially since this home doesn’t have a dedicated office. Here the pantries are with their doors opened up. 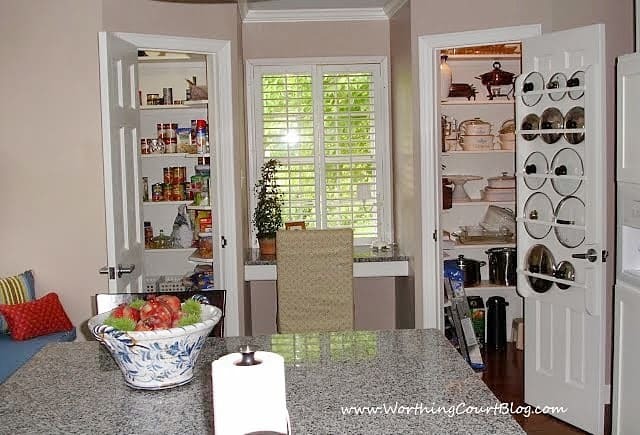 Linda filled every nook and cranny in her new kitchen with storage. 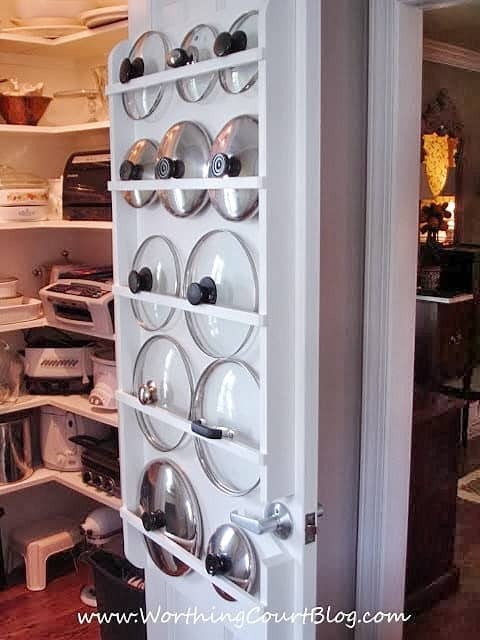 Both of the pantry doors were outfitted with diy holders for her pot lids. 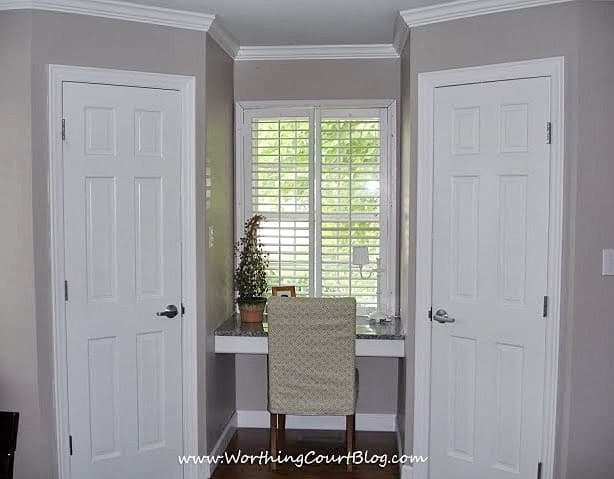 Window seats with built-in drawers were added under each of the two windows that are on the wall to the left of the pantries (the same wall as the dish cabinets). Hanging files were added to the drawer closest to the desk. 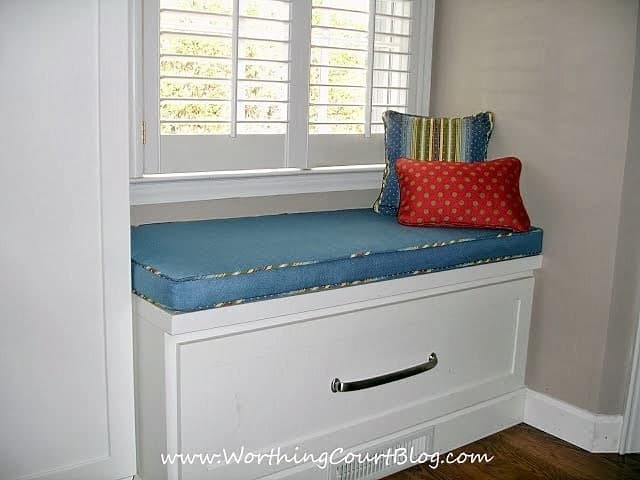 The other bench is longer and has two drawers that contain miscellaneous supplies. There was a narrow bit of wall left at the end of the new range/hood cabinet that Linda didn’t want to go to waste. So a sliver of a cabinet was added in the spot to act as a sort of command center. To save money, the electric panel was kept in its original location and is now concealed inside of the upper cabinet. 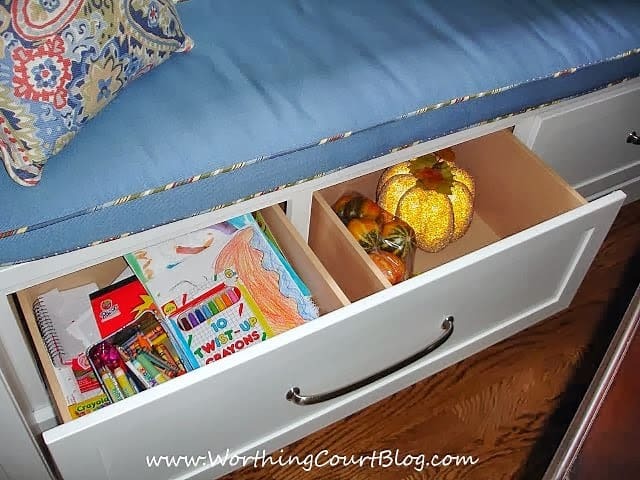 The lower cabinet contains a magnetic board message center with space below for taller items. I’m so happy for Linda and Gene – I know how many years they dreamed of this kitchen. 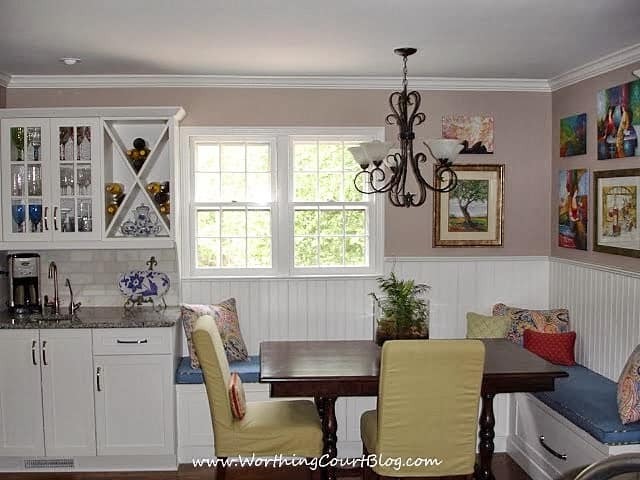 Linda describes this room as “A beautiful room that just happens to be a kitchen”. I couldn’t agree more! Beautiful! What a lovely new kitchen! Wonderful kitchen! I love all the details, especially the way the pot lids are stored! A wonderful transformation!! I am sure all the food taste 100 xs better int his lovely kitchen! Wow! This is gorgeous! If I just didn’t have ours redone, I would definitely be pinning some of these ideas. What a great use of storage, everywhere! Beautiful! 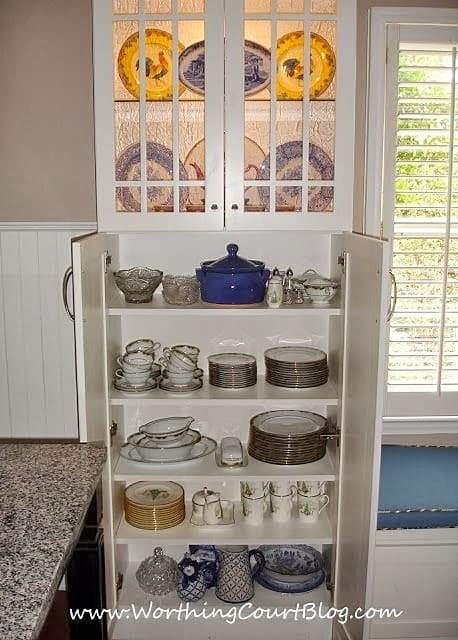 I love the cabinet for dishes and the pot lid cabinet. wow, that is just a fabulous kitchen! its the kitchen of my heart, but I had to think with my head last year when designing mine as my little terrors would have that lovely white kitchen ruined. The kitchen turned out terrific! holy moly! Great Kitchen!!! beautiful! 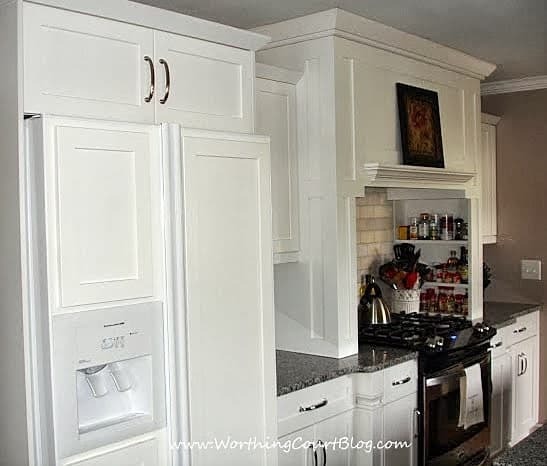 Love that door for lids… and that wet bar transformation…Good work, thanks for showing it. Wow, it’s beautiful! I’m so envious of all that storage! What a great kitchen. Love the idea of the lid storage, so perfect. That is a gorgeous kitchen. I love all the space, and organization too! Thanks for sharing at my newbie party. This kitchen has so many great ideas that I downloaded a few pics to my computer. We want to do a kitchen renovation in a year or so. I especially liked the wet bar/coffee station. Such a fantastic space now. What a gorgeous kitchen renovation! Love all of the built in storage! thanks for linking it up! This is a lovely kitchen! What a gorgeous bright and colorful kitchen. Thanks for joining WUW. I know she has to love it. I love the artwork on the walls, too. What a beautiful kitchen! I studied every picture and it makes me want to paint my cabinets white even more now. 🙂 They did a fabulous job and I’m so glad you shared it with us. I’m a new follower now! What I wouldn’t give to have that kitchen!!! I would love for you to link up Thursday to “It’s a Party”! What a beautiful kitchen, the details are so well thought out. I’d like to hear why she likes the sink in the island. @Kim @ Cheap Chic Home Great question, Kim! 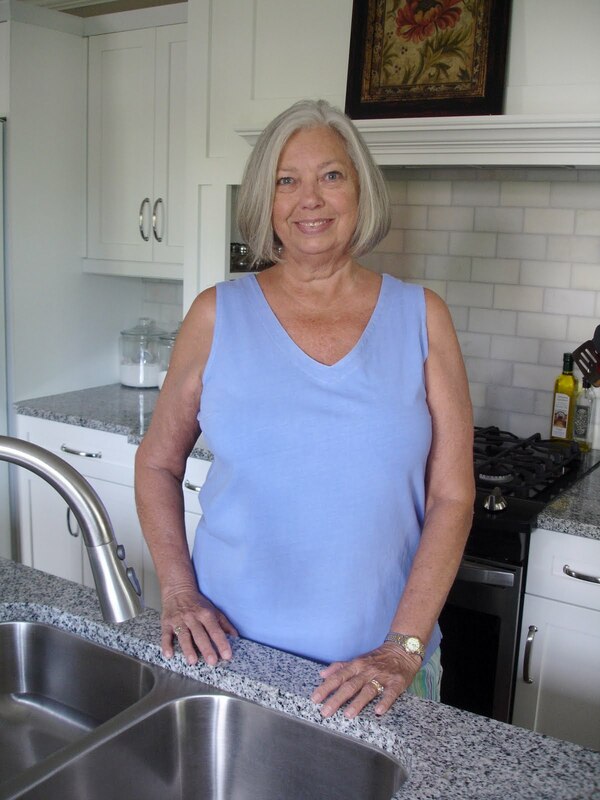 Linda knew that she didn’t want her sink directly under a window (like it had been in the previous kitchen) and she took into consideration that when she cooks, she always works close to the sink. The above reasons, coupled with the fact that she now has the perfect size work triangle and always has a beautiful view from her sink no matter which way she turns drove her decision. How did they build the hiding electric cabnit? 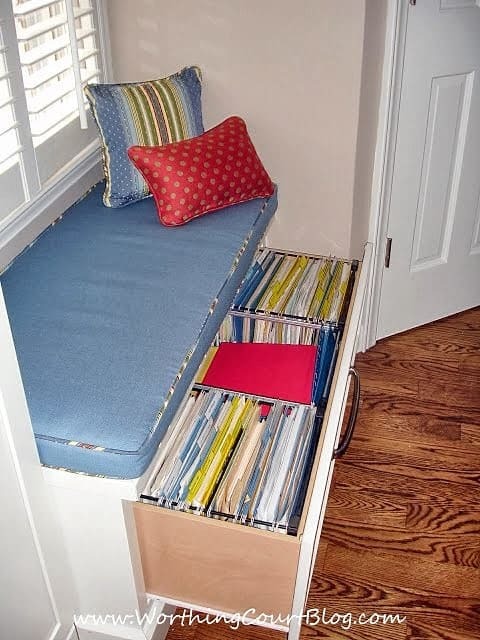 I especially love your use of space for storage. The DIY holders for pot tops is brilliant. Being in the construction industry, I am always on the lookout for great storage ideas to recommend to clients. Thank you! Is the cupoboard for the command center premade? Or custom? I need something just like that for a small wall in my mudroom. Hi Reanna. I believe that the command center was custom made by her cabinet maker. The kitchen remodel is beautiful! As I was looking on Pinterest I saw a picture of a chalkboard sign that said “In this house we trust in God…” There was a table with 3 drawers, 2 lamps and EAT was displayed on the table. 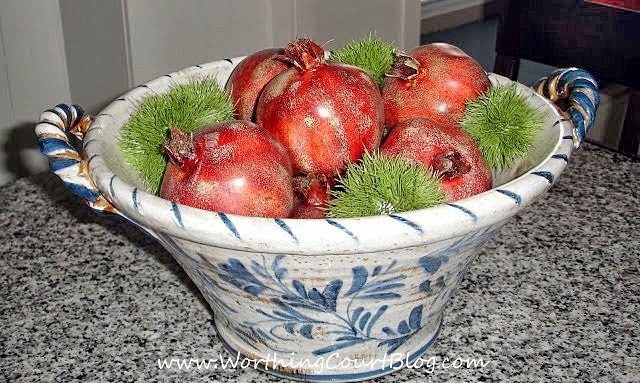 When I clicked on this picture it took me to your blog, but I’m not finding any information on this particular picture. I love the chalkboard saying and the table/decorations. Any help on where to find this would be appreciated. Thank you! Hi Traela. That’s very odd! I have no clue why that would happen. Have you tried clearing your cache and clicking again? I’m sorry, but I’m at a loss and don’t know what else to suggest. That doesn’t sound like anything on my blog. 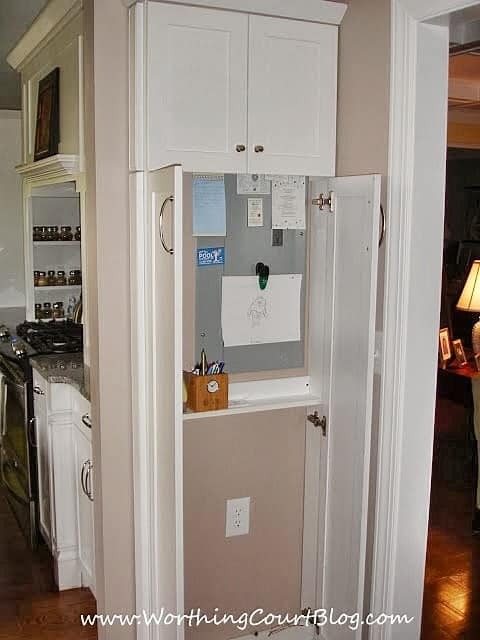 Can you tell me the name of the kitchen cabinet manufacturer that supplied the very shallow tall cabinet “sliver of a cabinet…acts as a command center” that you posted? I have been looking for something exactly like this.